I’ve been asked by a couple of people (namely SLPBridget) to talk about my “must have” therapy materials. So this is a quick post to discuss my therapy favorites. 1) I’ve devoted a post to these products already…but 2Gals and their therapy materials are fabulous. I (and my students) really enjoy the games “Looting Pirates,” “You Win,” and “Gold Rush.” At about $20 each, they are a reasonable expense for a variety of activities. I can do language, artic, and pragmatics therapy with all of them. 2) Go for the Dough. This fun game was purchased at Super Duper. It’s a great way to work on synonyms, rhyming, opposites, categories, multiple meaning words, and definitions. I’ve also used it for articulation…The kids don’t care – they just want the money! 3) Crocodile Dentist. Yes, there’s an app for it…but really, there’s nothing quite so satisfying as the squeals that occur when little fingers get “bit.” Guaranteed to make me laugh. 4) Candy Land Castle. My younger kids love this game…actually, my older ones do too, they just won’t admit it. I use it for color/shape naming/matching, articulation play, language play, pretty much anything. The kids love it because the little pieces go shooting out when the candy cane is pressed. 5) Cariboo Island. Another great one for just about any therapy target. Particularly good for the younger kids. Sometimes I will put a sticker or “treat” in the “treasure box” so when it opens there’s a bit more in there. The kids like it either way. 6) Webbers Jumbo Book of Artic Drill. Easy stimulus. I particularly use this for those sentences activities. Don’t get me wrong, it’s great for word/phrase level too. Easier than printing out gobs of things. The CD works great for printing out homework pages too (if I don’t use the FAME workbooks from 2Gals). 7) Giant Book of Phonology. Now, I’d be lying if I said this was all I ever needed for phono therapy. Some of the words are not what, in my very biased mind, I consider appropriate (e.g., “CAT” as a stimulus for initial K in words..you just don’t do that – at least not in the beginning!). But, I can (and do) pick and choose the words I want to use. It’s as easy as flipping open the book, tapping on the picture, and saying the words. What’s great about this is that there are 4-8 words per target sound – then phrases – then sentences. You can just keep the book open and repeat throughout the session (and no, the kids don’t get bored with it because you’re playing a game…but that’s another post when I talk about Cycles). 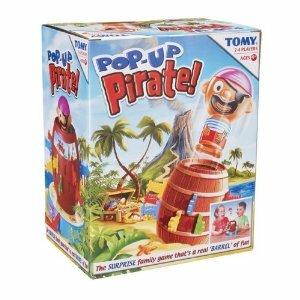 9) Pop Up Pirate. What can be more fun than sticking plastic swords in a barrel and making a pirate explode out unexpectedly? You’re right…absolutely nothing. Pop-up Pirate easily ranks as one of the top 4 games in my therapy room. 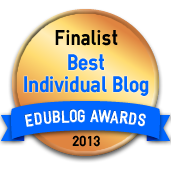 My preschool kids love it and so do my older kids (4th-5th grade). Pop-up Pirate can easily be adapted for language or artic or … pretty much anything. What’s best about this game is it’s no-muss-no-fuss. No set up required. Open the box, take out the barrel, pop-in the pirate. As you can tell, I have very few things that I use that are strictly one or the other thing. They can all be adapted (easily) for language, artic, or whatever. I’m sure I missed a few items (after all, it is still summer break for another week)…but these are the ones I know I would need want if I started a new position. I’m really looking forward to hearing what others see as “must-have” materials. Please, drop me a line here and let me know…I’m always looking to expand my therapy activities. Thank you for the shout out and the endorsement! Great ideas Mary! I have always made my own thumball (write questions on a beach ball or other similar ball with a sharpie and draw border lines around each question). Then you can individualize the questions to target specific things. Instead of always making the thumb the target finger, you can let the thrower yell out the target hand and target finger (e.g., left pinky). Then the catcher answers whatever question their left pinky is on! Great way to add more language in. Thanks for sharing your fave materials! I’ve done something similar with the location (thumb, pinky, etc.). I’ve seen the beach balls – which would work great for those kids with poorer motor skills. I like the soft small thumballs simply because they are soft and don’t hurt when you get hit with them. Beach balls can sometimes sting. It’d definitely be an easy way to tailor the activity. I like the students having to create the question too.. great comment Hanna, thanks. Thanks for sharing all your great ideas Mary! I have always made my own thumball by writing questions on a beach ball (or other similar, cheap ball) with a sharpie and drawing border lines around each one. That way I can individualize the questions to the therapy I’m targeting. Rather than always making the thumb the target finger, you can also have the thrower yell out the target hand and target finger (e.g., left pinky) and the catcher then answers the question his/her left pinky is touching. Fun way to add even more language to the game! Thanks again for sharing all your therapy faves! Thank you for sharing – I’ve never heard of a Thumball and it is now definitely on my make list. Questions words are always difficult to elicit. I have been an SLP for 25 years, and I have to say – I would have chosen the same items!! I have them all, and they continue to be my “go to” activities! But the IPad has been the best investment I’ve made in a long time. I tend to use it for all my therapy sessions – wither just for drill and practice (I LOVE LOVE LOVE the fact that it keeps accuracy for me!!) followed by a “hands on” game, or I will use the IPad exclusively – for d/p as well as reward time.